In our first floral tutorial (Easy DIY Flower Arrangements – Part 1), we discussed how to make a simple baby’s breath boutonniere as well as a groom’s boutonniere. 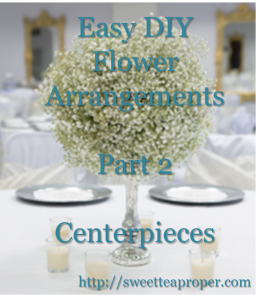 As with the first tutorial, the examples used for arrangements in this tutorial were the actual flowers that I used in our wedding and could be used for any special event including weddings, bridal showers, baby showers, homecoming, prom, etc. For our wedding, I had decided early on that I was not going to use a florist. The main reason was simply to save money. Without formal training and very little floral experience, that meant finding centerpiece ideas that required little know-how. Originally, I searched through Pinterest, Google, wedding websites, etc. for ideas on centerpiece arrangements that didn’t use flowers, but the few that I did like were going to be quite expensive so it didn’t really help with goal number one. Then, I saw it. It was the perfect centerpiece for a vintage-inspired wedding – a round baby’s breath ball on a mercury silver candlestick holder. I already knew how to make a round flower ball with carnations, so I assumed the process would be the same or at least similar to that. I purchased a trial floral foam ball and baby’s breath to run a trial centerpiece before the big day. The trial turned out well so I went ahead and purchased the materials needed for 10 arrangements. There are so many great things about working with baby’s breath. It is an easy flower that doesn’t require as much water or temperature requirements as other flowers. These arrangements were made on Thursday for our wedding which took place on a Saturday evening and looked great. Due to the weight of the foam ball, we were not able to attach the centerpieces to the mercury silver candlesticks until we were at the reception facility. Transporting flower arrangements is not fun. It’s very difficult and stressful. If you can make the arrangements at the final resting spot, it will be in your advantage. The following materials list is what you will need to make 1 floral arrangement. Simply multiply the flowers, holders, and foam balls by the number you need to create more. It took approximately 1 hour per arrangement created. *STP Tip – Our arrangements were able to stand on the candlestick holder without toppling over. However, the arrangements were not completely secured. If you think your arrangement could fall over or easily be knocked, we suggest placing the foam ball on a larger base for more security. (1) 8 – 10″ foam floral ball *Do not get the styrofoam. It needs to be floral foam so the ends of the baby’s breath can go through it. *Update: I’ve had a lot of requests for where to find the candlestick holders that I used in the picture (which were from Michael’s, but I have not been able to find them in store anymore). These are not the same candlestick holders that I used, but they are the closest ones I could find online. Hope that helps! The largest work space that I had available was our wood dining room table. 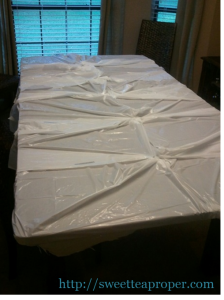 Since not only was this going to be a mess, but a wet mess, I laid down a layer of plastic sheeting over the table for protection and then a towel to absorb any excess water. 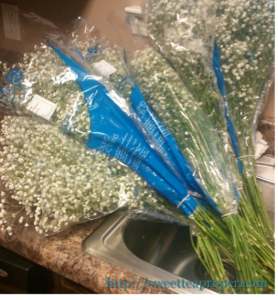 Cut the ends of the baby’s breath and place the flowers in water. If you are only making one or two arrangements, you can put the flowers in a vase. Since we had such a large amount of flowers needed, we chose to put the flowers in the sink. Once your area is prepared and the flowers begin soaking up water, the first step in building this centerpiece is to take the floral foam ball and submerge it in water. It is very important that the foam ball has water evenly dispersed throughout so it will be necessary to take your hand and press the ball and turn the ball when it tries to float up. Once the ball is fully saturated (it will be quite heavy), place it on a secure surface (we used old potting jars with rocks in the bottom). For step 2, take a pair of scissors and cut off one strand of baby’s breath approximate 6 – 8″ in length. The length will determine how large the ball will be. 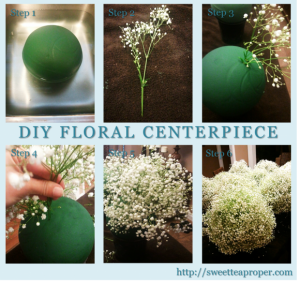 Place the cut baby’s breath and insert it into the foam ball. It should slide in fairly easily. The key is to do it without bending the stem. If the stem bends, the flowers will not stand upright nor receive a sufficient amount of water. Continue to cut the stems and insert it into the foam ball, filling in holes as you go. Once you have put 2 bunches of baby’s breath into the foam ball, it may appear as if you are finished. As time passes (even a day or two), the baby’s breath will begin to slightly thin out. 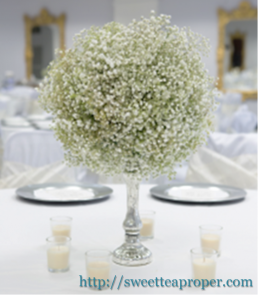 For a fuller ball, it is essential to use all 3 bunches of baby’s breath. After all of the baby’s breath are inserted into the floral foam ball (don’t forget the bottom which will be visible if on the candlestick), the baby’s breath ball is ready for transport. Once the baby’s breath balls have arrived at the final destination point, carefully grab the foam ball and insert it onto the base. Since the mercury candlestick holder was lighter and much smaller than the baby’s breath ball, it was necessary to push the arrangement down several inches. Although this limited the height, it added significantly to its stability. Place a few votives around the bottom for additional ambience and there you have it – a beautiful and elegant floral centerpiece ideal for any occasion. The centerpiece will stay lovely for at least a couple of weeks so consider keeping or donating it after the event. Hospitals and nursing homes are always appreciative.